Menari, the centre of a prosperous native community cultivating fertile gardens on the hilly slopes, lay at the junction of two creeks; their banks fifteen metres high. It was reached from the Port Moresby direction after crossing a towering mountain before the track fell swiftly to the flat ground around the village. Menari was the site of the well-known photograph of the 39th Battalion on parade being addressed by Lieutenant Colonel Honner after it had withdrawn along the Track. The famous war photographer, Damien Parer, filmed the parade. It was to Menari that Brigadier Arnold Potts and his headquarters withdrew late on 8 September after the desperate battles at Brigade Hill and Mission Ridge, near Efogi. 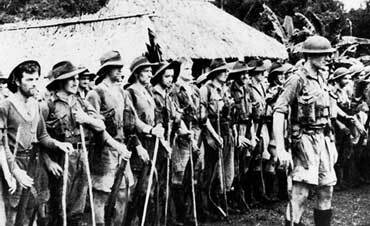 Meanwhile, the 2/14th and 2/16th Battalions, both under Lieutenant- Colonel Albert Caro, had begun marching through thick jungle to the east after their withdrawal route down the track had been barred by the Japanese battles. Fearful that he would be cut off if the Japanese reached Menari, Lieutenant-Colonel Caro left a small protection party with his casualties and stretcher bearers who were moving slowly and sent most of his troops on to Menari. 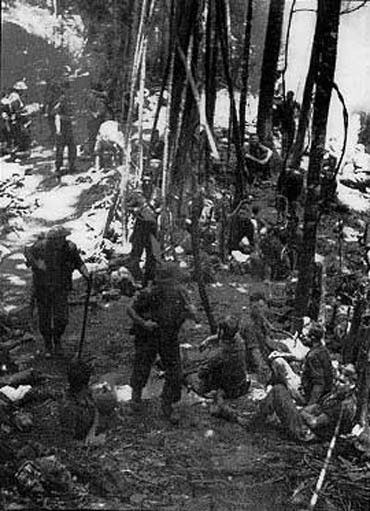 The troops arrived at Menari at 1130 pm on 9 September just as the Japanese were gathering force for an attack. By late afternoon it was clear to Brigadier Potts that the position was dominated by the high ground on the track to Efogi and he ordered a further withdrawal. The 2/14th Battalion covered the withdrawal and broke contact at Menari in the morning of 10 September. By afternoon the battalions had reached a point on the Maguli Range beyond Nauro village. The two battalions together now numbered a little more than 300 all ranks. Here Brigadier Porter arrived to relieve Brigadier Potts who was ordered to report to Port Moresby. There was still no word from the 2/27th Battalion which had covered the withdrawal from Efogi two days earlier and was making its way south through the jungle-covered valleys. During the counter-offensive several weeks later the 3rd Battalion reached Menari on the afternoon of 2 October without opposition. There they buried twelve Japanese and saw evidence that the Japanese had been reduced to eating wood and grass. They also found the bodies of two Australians, one bound to a tree and the other decapitated.